As I type this it is 67 degrees outside… easily the warmest day of the year! I’m about to go on a nice, long run and I’m definitely looking forward to running in a t-shirt!!! 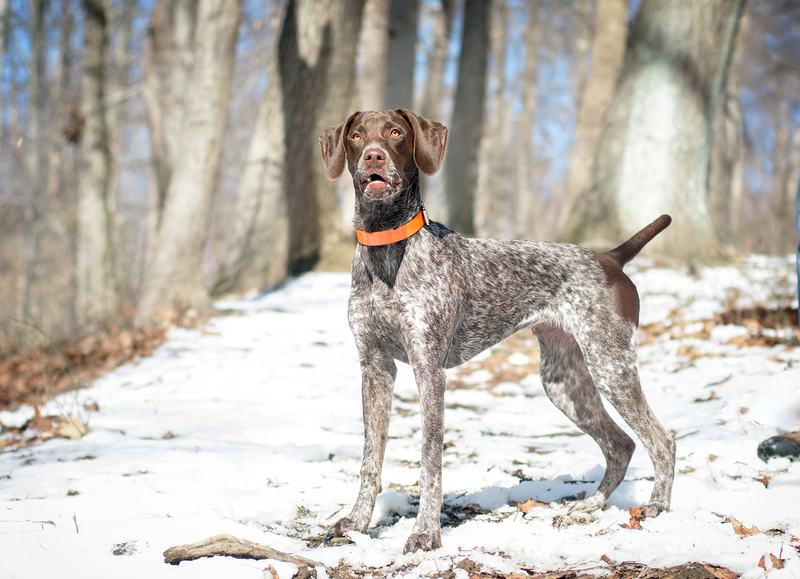 Before I embark on my run I want to share some photos from a hike that Matt, Piper and I took last weekend. 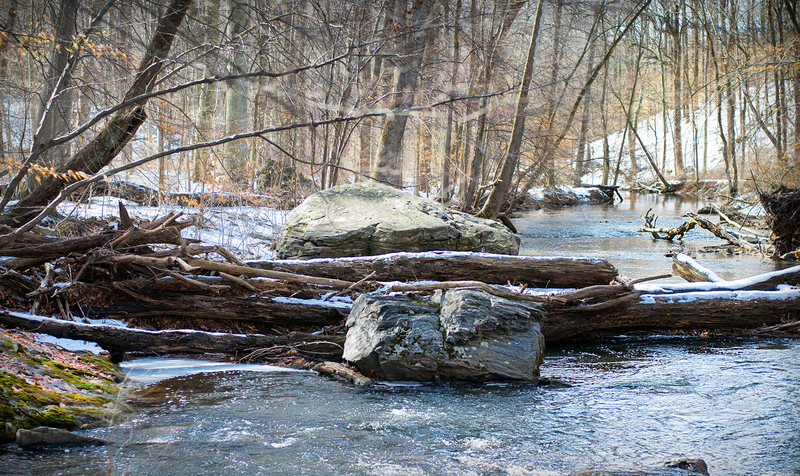 We explored out a different part of Ridley Creek State Park on Sunday and it was beautiful! We typically stay on the west side of Ridley Creek but on Sunday we ventured eastward to the park’s Orange Trail. This single track path follows the eastern bank of the creek before looping back through a hilly forest. The trail is well marked with orange blazes and the entire lasso-shaped loop was about 2.35 miles long. 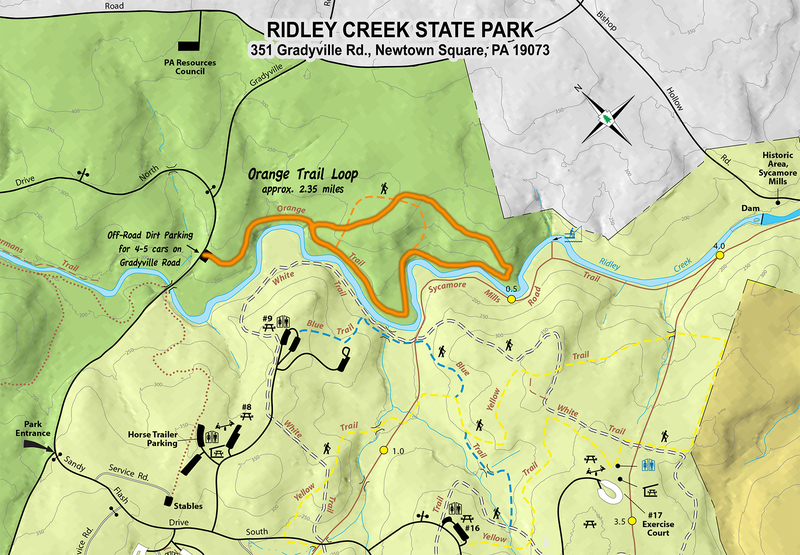 Oddly, the official DCNR map shows a shorter orange loop than what was marked in the woods, so I overlaid the outline of our actual hike on the above map. Piper had a blast, as usual. She is getting very comfortable climbing on boulders, logs, dirt piles and anything else we find in the woods. She also really wants to go in the water but it’s still pretty cold out so we still haven’t really let her get more than her paws wet. I can’t wait for warmer weather! !